Excellent to communicate important information to guests and staff members anywhere in the facility. (2) AAA Rechargeable battery. Easy to change Battery. Covers pagers and transmitter for two full years from the date of purchase against any manufacture defects. Long lasting clips. Never have to worry about clips easily breaking. Stronger vibrations, light or sound that will be sure to get the attention of the customer. Resistant to liquids and water. Prevents any damage to the pager by mild to moderate water exposure. The Multi-Msg alert paging system lets customers and staff members know exactly why they are been page and what they might need to do. This paging system was developed to help business communicate better with staff members or customers. The pager has four (4) messages that can be predetermined by the administrators. The pager has four different LED lights, each signaling a specific message to the end user. Administrators can easily change the messages by swapping out the inserts, attached to the pager. As a business owner communicating with staff members or customers can be a challenge. 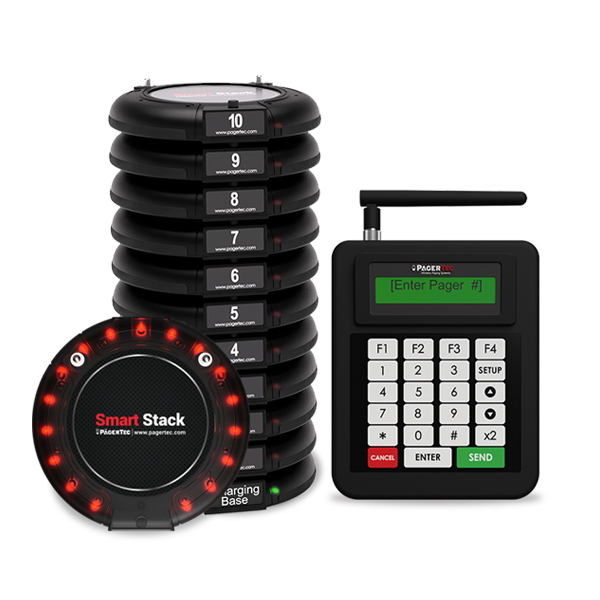 Now you can do it better with the Multi-Msg alert paging system, the transmitter is powerful enough to emit signals across long campuses with and easy to use system. For Staff to Customer application Customers is handed a paddle pager that can alert them of a specific message by lighting up a flash on the message that is intended for them. For Staff to Staff application Staff can keep pagers with them at all times (Belt Clipped) and can be alerted of a specific duty or task, with the flashing message that is intended for them. 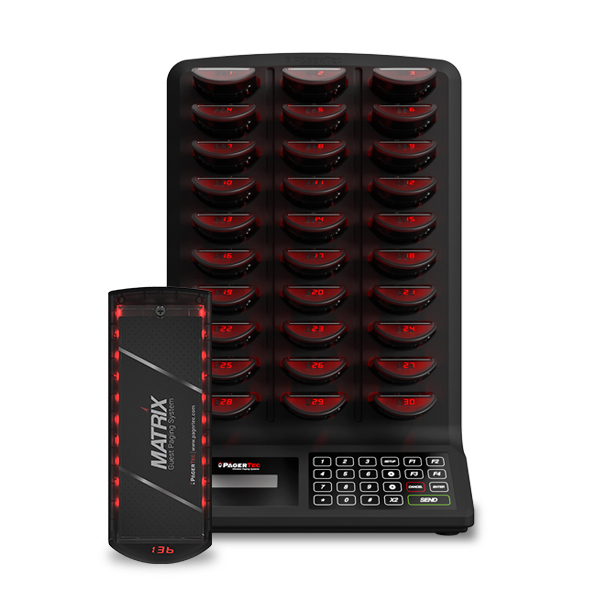 Is a Pagertec paging system easy to set up and operate? 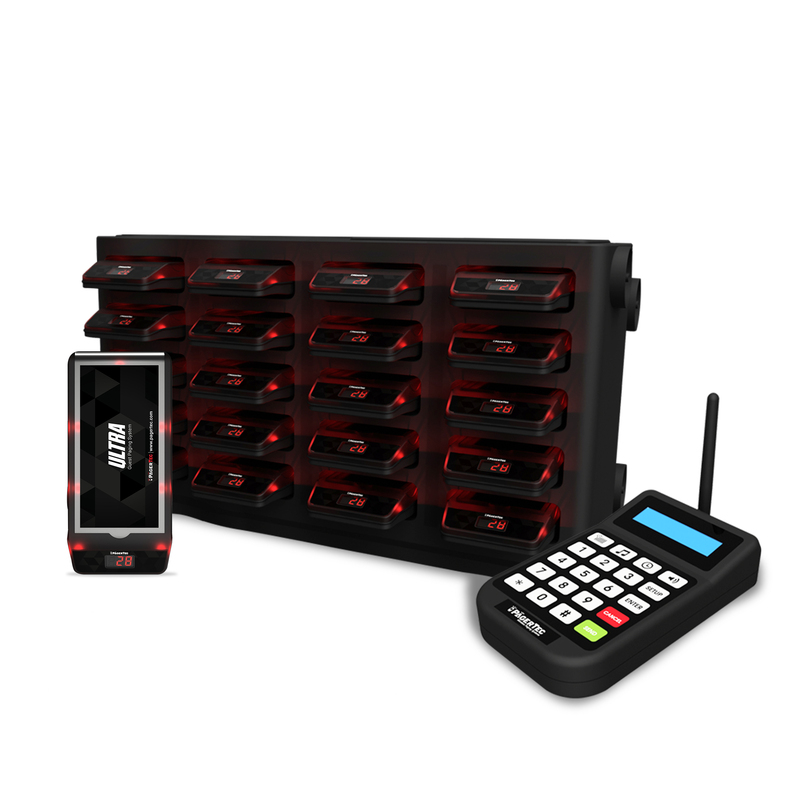 Pagertec wireless paging systems are all ‘Plug and Play’. When we ship pagers they are fully charged, this way when you receive them you can take the system out of the shipping box, plug the transmitter into the wall and start paging. Some paging systems may not be fully charged when they arrive due to long shipping times, so we always recommend for the systems to be fully charged when they arrive. Our paging systems do not require any programming, wiring or installation, and minimal training is needed to show new staff how to operate the system. Simply key the pager number that is desired to notify and press “Send” on the paging transmitter. How long is technical support offered for on the paging systems? Technical support is available for as long as you own our system and it’s always free. What kind of warranty does Pagertec offer on its paging systems? The paging system comes with a 2-year Manufacturer Warranty. This will cover any manufacture defects that the equipment has. Pagertec also offers a 30-day money back guarantee on our paging systems, we are so confident that you will like our paging systems we give you 30 days to try it or your money back, no questions asked. Please Visit our Warranty Information page. What is the range of your system? Pagertec paging systems are made with the best radio transmitters and receivers to provide the best range possible for the system. There is no way to absolutely guarantee the range of a paging system. There are many different variables that may change the range of the paging system. But normally if your expected range is less than 1 mile then you should not have any kind of trouble with your paging system. If you need more range, Pagertec offers range extenders to give you enough range for your system. Range is never an issue with us! If we buy a small paging system now, can we expand our paging system later on by adding additional pagers? 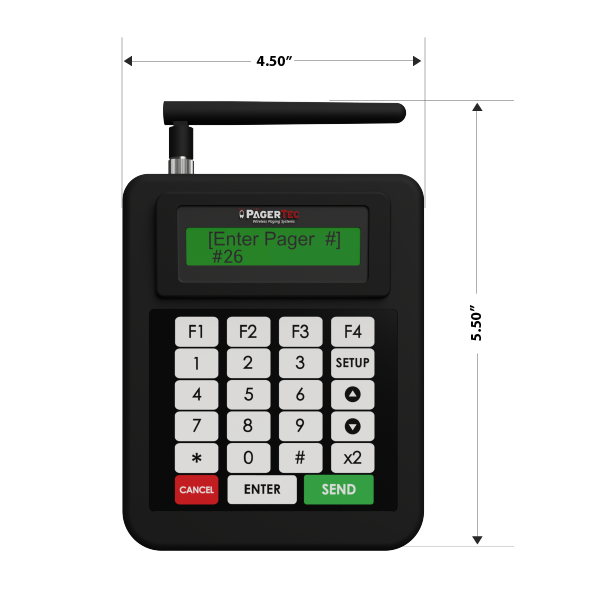 Pagertec paging systems are 100% expandable; there is no need to worry about not ordering enough pagers. If in the future you feel that you did not order enough pagers you can simply call us to 1-877-593-4545 and order the amount of pagers you need. Your new pagers will arrive pre-configured starting with the next pager number in sequence. How long do your pagers last with a full charge? 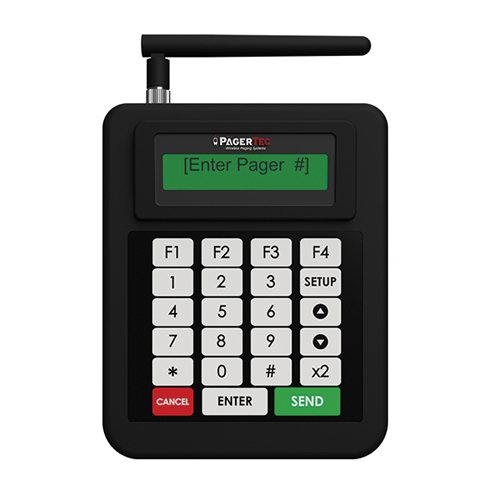 Pagertec pagers vary in time of use due to the length and intensity of the vibration, lights and tone requested by the customer. Normally the pagers are good for an entire day of constant use. When the establishment is closed, simply put the pagers to charge for a couple of hours for the pagers to perform at optimal levels the following day. What kind of batteries do the pagers use and how long do the batteries last? We use Nickel Metal Hydride (NiMH) batteries that last much longer and don’t have the ‘memory’ problems that pagers with Nickel Cadmium (NiCD) batteries have. Thanks to the ‘memory free’ technology in our batteries, you may charge the batteries anytime you wish, regardless if the batteries are fully drained or not. Typically our batteries are rated and tested to last up to 5 years. Will the system interfere with our wireless sound system or wireless microphones? No. as a matter of fact, the government has licensed different types of equipment to operate within different frequencies. 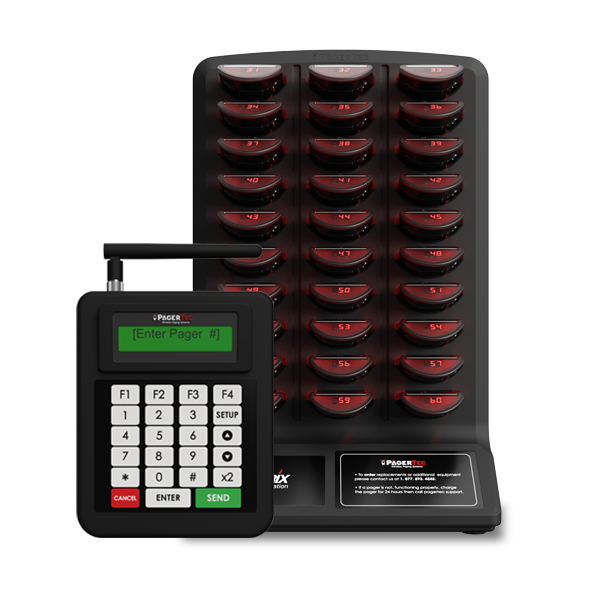 The frequency that our paging systems use is far different from any other normal electronic. Our systems usually operate at 450-470MHz. Are Pagertec pagers durable against drops and falls? Yes. Our pagers are built and tested to withstand up to thousands of drops. We build our pagers with the toughest Lexan available to provide durable and reliable pagers made to withstand even the toughest environments. How long does it take for the systems to ship? Normally we keep everything in stock. It usually takes about 2-3 business days to ship your order. If you need your order urgently please let us know for rush delivery.